Do Slovakia's Health Professionals Set a Good Example? Most smokers in Central Europe today may well know that smoking is hazardous, but how many are aware of the enormity of those hazards? People in developed countries often confuse big risks with small risks. They generally grasp neither the extraordinarily high risks from tobacco smoke compared to those from other lifestyle practices nor the substantial benefits of cessation. In the United States, the United Kingdom, and other western nations, about half of all persistent cigarette smokers will eventually be killed by their habit. But, even long-term smokers who have so far escaped incurable cancer or some other fatal disease can quit smoking and drastically reduce their future risk of death from tobacco. In Central Europe the health risks per smoker are probably slightly greater than in North America and the proportions of smokers is substantially greater. So, men in Central and Eastern Europe have the highest death rates in the world from tobacco use. And, if women smoke like men then eventually they too will die like men. Tobacco-related death rates in women are now beginning to rise (see table) and within a few decades will comprise a substantial proportion of the deaths in middle age. But at present more of the victims of tobacco in Central Europe are middle aged men. Twice as many Central European as Western European men at ages 35 - 69 die of tobacco-related diseases, and those killed by tobacco in middle age lose an average of 20 - 25 years of life! Life expectancy for men in Central Europe has been decreasing since 1975, and the cancer rate has been increasing - indeed, their lung cancer rates are now the highest in the world. And tobacco is the main culprit. In Central Europe, of every 10 men aged 35, 5 will die before age 70 and 40% of these deaths will be from tobacco. In contrast, in Western Europe of 10 men aged 35, 3 will die before age 70, and only a third of these deaths will be from tobacco. Cigarette smoke contains nicotine, which is addictive, but also contains about 4000 other known chemicals, which collectively cause an extraordinarily wide-range of diseases - cancer of the mouth, throat, lung, oesophagus, stomach, pancreas and bladder ; heart attacks, strokes, stomach ulcers, and arterial destruction, plus emphysema and other respiratory diseases. A few conditions such as Parkinsonism, and possibly endomental cancer, may be made less likely by smoking, but tobacco causes 100 times as many deaths as it may possibly prevent. Also, tobacco exacerbates the dangers from other factors such as diabetes, radon exposure, environmental pollutants, high blood pressure or cholesterol. And tobacco smoke can harm the non-smoker, although the magnitude of the risk is probably not large. A chief sources of confusion about the adverse effects of tobacco is the long delay between cause and full effect. The risk of lung cancer - the primary cause of death from tobacco - is much greater among those who started before age 20 than among those who started later in adult life. Thus a sudden large persistent increase in cigarette use of young people will have its full effect on mortality in middle age a few decades later. In the United States, for example, the large increase in cigarette use in men between 1915 and 1945 resulted in a fivefold increase in lung cancer mortality in men between 1945 and 1985, even though there was no further large increase in cigarette use among American men after 1945, (see Figure). This pattern of a large increase in cigarette use followed, after a delay of several decades, by a large increase in lung cancer deaths has already been seen in many developed countries, including those of Central Europe. 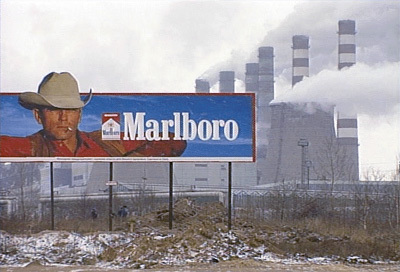 This long delay between exposure and full effect may lead to confusion about the real cause of the high lung cancer rates: in Central Europe, for example, the high rates of lung cancer are often unjustifiably blamed on pollution or industrial exposure s rather than on the smoking practices of earlier decades. Tobacco Use Causes Other Diseases. In the United States, for example, the Surgeon General has estimated that in 1985 tobacco caused almost 20% of all US deaths that year just over 100,000 of these deaths were from lung cancer and just under 300,000 were from other diseases. The adverse effects of smoking - other than lung cancer - vary from population to population. Smoking is particularly cardiotoxic for people who already have other risk factors such as high blood cholesterol levels, common - in Central Europe and it exacerbates the risks of cancer of the upper aerodigestive tract among regular alcohol drinkers (also a common phenomenon in this region). The fundamental fact that tobacco kills people may be lost in all this mass of statistical and medical evidence. Death in old age is inevitable, but death before old age is largely avoidable and in Central Europe the most important strategy for achieving this is to reduce the number of premature deaths from tobacco. Somehow we need to keep in focus the vast scale of this epidemic. in one sense we can be optimistic: even a 10% reduction in such vast numbers will save thousands of lives, and this is achievable. But in another sense optimism is difficult to sustain, for clear medical evidence has been available for decades, yet many leaders and policy makers either remain ignorant of the magnitude of the hazard or worse still - fail to make anti-tobacco legislation and mass education a priority. In Britain, half the persistent smokers are killed by their habit; tragically, in a recent survey half of them agreed, with the statement that "smoking can't be really dangerous, or the government wouldn't let cigarettes be advertised". It is and they do, how can such absurdities persist?